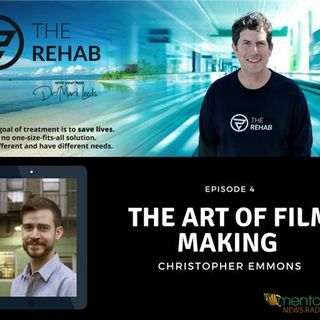 This episode of The Rehab features an interview with Christopher Emmons, an award-winning film maker who has expertly written, directed and produced films about the topic of addiction, alcoholism and more. He grew up in Milwaukee, where he had a great interest in filmmaking. While earning his Bachelors at the School of the Art Institute of Chicago, he wrote and directed the dark comedy feature “Shine Baby Shine” about a bumbling shampoo salesman. His ?lms since have enjoyed much success on the ... See More festival circuit, including “New Skin,” “Surrender,” “Prone,” “The Survivor,” and the soon to be released “Roebling’s Bridge,” the little known true story of the family behind the Brooklyn Bridge. Also coming soon is Emmons’ next feature, “The Eighth House,” a thriller about a veteran who gets pulled into an astrology based cult. Christopher is an award-winning, master film maker. He is a writer, editor, producer as well as a musician and composer. I first became aware of his work after seeing a film named Prone. Prone is partly a story about addiction. Prone is not Chris's only film on the topic. The film, Surrender, is about alcoholism. In this episode, we explore the art of film making, particularly how addiction has been portrayed in films. Chris also gives his perspective of the movie industry and mainstream films. Finally, we learn about a new film, Roebling's Bridge that is a period piece, soon to be released. This is Chris's latest work that follows the planning and building of the Brooklyn Bridge.